robert millar is generally regarded as perhaps britain's finest cyclist - almost definitely scotland's finest. yet brian smith won the british national championship twice before robert achieved the same, and managed two second places in between his two victories. 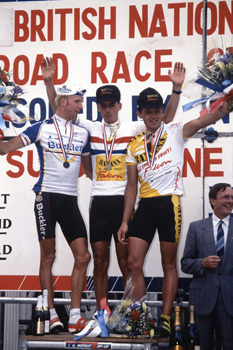 brian retired at the end of the nineties, meaning that us scots had almost two decades worth of someone to cheer for in the professional peloton. currently providing us with the benefit of his years on the international cycling circuit as anthony mccrossan's accomplice in the cycling.tv commentary booth, brian smith continues to be a presence in british cycling through his work with the braveheart fund, the annual tour of britain, and as a participant in this year's london-paris ride. currently domiciled in the south of england, brian lives with partner kerry keeble, daughter of ron keeble (1972 olympic team pursuit bronze medallist) and their two month old son, ethan. if you hadn't become a professional cyclist, what would have been the alternative career path? I was into football when i was a boy. In fact i won the Player of the Year in my area in 1979. That year I asked Father Christmas for new football boots. I got cycling shoes...! My mother and father were cyclists and my brother was following in their footsteps so it was inevitable that I had to follow suit. I thought cycling was too hard at first, until i won my first event. All that pain seemed to be worth it! why did you retire from professional cycling? Two reasons - financial and patella tendonitis. I had niggling tendonitis, but the main reason was the difficulty in securing a decent contract to be able to live a normal life. Nothing was happening in Britain when i decided to retire, and foreign teams were looking after their own. The options were another three to four years of earning little money for doing something i love, or earning more money for something i didn't love. The money was the deciding factor. The skills i learned in those four years have helped me in my career today. you've often said in conversation that your job with motorola was that of a domestique. is this a position you were happy with, or do you think you would have made a good team leader. I was taken on to do a job which I thought I did better than most. Hennie Kuiper even came to my defence when the team decided not to keep me on. With time I would have developed and given the opportunity, I would have loved to have been given the opportunity as a team leader. It is sometimes easier to opt out of leadership due to the extra pressure. I would have welcomed more opportunities to have experienced that pressure. you have a reputation for being the 'hard scotsman' - ie not wearing gloves even in cold weather. is this a cultivated stance, or are you really the 'hard scotsman'? From my experience I have rarely known many other riders to train as hard as I did. Conditions never really bothered me. In fact I would smile when i woke up to bad weather, because I knew that half the field would not be happy. Gloves make you soft....if your hands are cold then it takes your mind away from the pain in your legs! any possibility you'll ever write your autobiography? I've got many stories from my racing career and have been asked this question a few times. Maybe one day when I can reflect on my whole life in cycling, taking into consideration the experiences I am having at the moment on the 'other' side of the fence. what were you doing before cycling.tv happened along? I set up my own sales and marketing business. A cycling education does not give you the experience required for many other careers outside cycling. Sales and marketing is about confidence and motivation. That's something I always had in my career. possibly since your solo commentating effort at the worlds in 2007, the line between pundit and commentator seems to have blurred, and very much for the better. have you been aware of this, or is it a natural development? Natural development and being more comfortable with the commentary. "Say what you see " and "be yourself" is my motto. I have learned a lot from Anthony over the last couple of years, and that has helped my confidence and development. if 'pundit' is your current job description, any notions for what the future might hold? I would like to be the Andy Gray of the cycling world. I would also like to develop other opportunities within the cycling world. Cycling is becoming more and more global and commercial every year, and I would like to help make cycling the number one sport in the world. you seem to have an uncanny knack of 'reading' a race, with remarkably accurate race predictions. is this as a result of having been a pro, or something you've worked at? I spend a lot of time watching the racing and researching the results, and after almost three years can sometimes determine what is going to happen in a race before it does. My relationships with the team managers and riders help me anticipate what they are going to do next. Another giveaway is a rider's body language. It's something I used to observe while I was racing. I gave advice to a UK based rider once and told him what the other teams would do when the advice was taken. His team laughed when the other teams did exactly what i said they would do. The great thing about cycling is that you will never always get it right, and you can never predict the unexpected. That's what makes cycling so exciting. you and anthony have been described as the morecambe and wise, or the hale and pace of cycling commentary (mostly by me). do you get on this well with most folk? I think I do. There is no room for egos in the commentary booth, and we need to work as a team. I think of commentary as sitting with a good mate watching the racing and having a laugh. Anthony understands my sense of humour and like most other cyclists can take a ribbing. Some people say I give him a hard time, but it's all part of our technique. And despite humour being a big part of our commentary, we always commentate on the action when it happens. it would seem that, in the world of cycling, scotland frequently punches above its weight. why do you think this is? It 's harder for a Scot to make it in cycling. That normally gives you a hardened outer shell to cater for all the hard times ahead. There is of course something in the water. That's why Scotch whisky is so good! any thoughts of moving back to scotland? I cannot do the same career in Scotland. I would love to have some type of home in Scotland. That's something I need to work hard for. has becoming a dad imbued you with a new sense of responsibility, or are you just the same as you ever were? Losing my father gave me more a sense of responsibility so I would say I have not changed much. Becoming a father has presented me with something else.... happiness that i never thought I had. Kerry and I work as a team, so that helps young Ethan get the requirements needed. He is only two months old, and I look forward to spending time with him every day. How else will he pick up a Scottish accent? how much a part of your current career is the braveheart fund? More than I care to imagine. I do something regarding the Fund pretty much on a daily basis. I am lucky to have Alan Miller and now Graeme Herd to take some of the working responsibilities. Alan is the backbone of the team and I am the face of it. Graeme has been taken on to help the riders with a more hands-on approach, something I found hard to do from South England. Although we all work hard at developing the Fund, it fills me with pride when I see a rider's success, the amount of people at the Annual Ride, and a smile on everyone's face at the dinner. It's truly amazing to see such generousity in Scottish cycling. It's a kind of an opportunity to make things bigger and better. 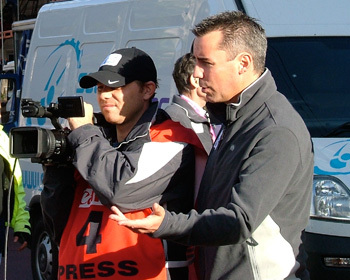 you said recently that at the tour of britain you just 'hung around' while anthony was doing the work. since i find that unlikely, what is your role at the tour of britain? I work on the TOB as part of the race direction team. We are responsible for the safety of the riders and making sure of a clear passage - something that is very difficult to do in our busy UK roads. I also help out with team liason. 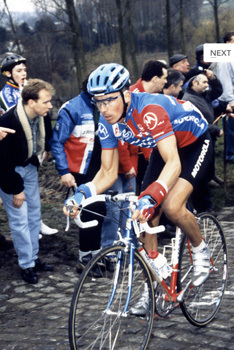 were you always a humorous fellow in the peloton, or, like robert millar, is this a post professional career thing? I have known Robert almost all my life and cannot see any change. I think he has just relaxed with strangers more in his life. I like the 'Cafe Commentating' theme we have at CTV because this was what i was brought up with in my early days. why did you decide to ride london paris this year? Anthony rode the event last year and raved about it. I wished I could have ridden it last year, but I had little time to take a holiday and that was the period of time I put aside for a trip to Spain with Kerry. This year I decided that it was something i wanted to do. There are not many events that you get the chance to ride into the centre of Paris. The buzz about the event is great and I'm looking forward to meeting many new friends. now that you're training 'seriously', do you find it a struggle, or is it just like riding a bike? Compared to what I was like in the past, it is a struggle, however, I have learned to slow down and enjoy riding my bike so that it's no longer too much of a struggle. Every day I trained as a pro, I always knew I would take my body to its limits. Now I know if I want to stop I can and if I want to ride slower I can. I am now appreciating more the enjoyment that is cycling. Any preference for shimano, campagnolo or sram? Are you mechanically adept, or do you need a mavic car in tow? What's the most stylish jersey you wore when riding? 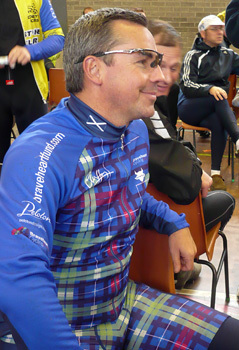 The new tartan Braveheart Fund top.